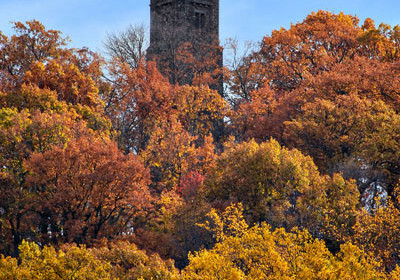 Rising 125 feet in the air atop Bowman’s Hill and offering a 14-mile view on a clear day, Bowman’s Hill Tower is a favorite stop for locals and tourists alike. The Tower is located near the corner of Rt. 32 (River Road) and Lurgan Road, a few miles south of New Hope, Pa. On a clear day, one can see to Trenton, New Jersey, and realize the magnitude and distance of the march Washington and his soldiers undertook in December of 1776.